Music is integral to Arena Stage's Snow Child, and actors sometimes join the house band on their own instruments. In Ivey's novel, the childless couple are homesteaders who have moved to Alaska from Pennsylvania in the 1920s. Ivey says seeing her story on stage was amazing. "It was a kind of surreal and very moving experience to watch it, sort of like watching your dream come to life on a stage where everything's kind of the same — but not quite the same," she laughs. Perhaps what surprised Ivey the most was the decision to turn the book into a musical. Ten days before previews began, the cast and crew gathered to rehearse for the first time with all of the musicians. Among the observers that day were composers Bob Banghart and Georgia Stitt. Banghart is a native Alaskan with a background in folk music. Stitt, who also wrote the lyrics, has classical training and works in musical theatre. Stitt says Arena's artistic director Molly Smith sent her the book, "and said, 'Do you think this is a musical?' And I called her before I was done, and I said, 'Yeah, I'm not done with yet but it is definitely a musical. And she said, 'Well, finish it and then we can talk.'" Smith was excited to do a play about Alaska. She is co-producing Snow Child with Perseverance Theatre, which she founded when she was living in Juneau. Smith says music seemed like a great way to give people a feel for what Alaska is really like, "because the natural world lends itself to a musical rendition. And because I've always loved the music that is in Alaska — which is often bluegrass. I think of it as cabin music, some of the most popular music in the state." In some songs, a couple of the actors join the string band with their own instruments. Bob Banghart says that bluegrass sound may seem more Southern than Alaskan, but "there was a long tradition of these types of instruments being up north and then it really solidified in the '20s with record players. And then the radio came in, forget about it, all you hear is country music," he says. "I like it, we're building an interesting stew — but it is musical theatre and that's the part that I find so intriguing." Another part of that stew is a sense of isolation that can be overwhelming in a place as vast and wild as Alaska. Stitt says they had to find a way to capture that as well. "How do you create silence through music, how do you create space through music?" she asks. "You know we are going to be on a stage that won't feel anything like what it would feel like to stand out in the open in Alaska. And yet we're trying to create that sense of emptiness, and how can the hollowness of the music express that." As the play opens, a woman stands alone on the stage. She and her husband, the childless couple, are heading into their second year in Alaska, struggling to create a farm out of the wilderness. She stands by a frozen river contemplating suicide, but when she hears what seems to be the voice of child, she changes her mind — it's the snow child, who brings wildness and magic into the story. And magic, says Arena Stage's Smith, is a big part of Alaska. "The natural world is magic to me, so my whole question was, if I can bring a piece of Alaska to the stage in any way, shape or form, and allow the audience to see it and feel it, we'll be successful. So that's what we tried to do." Alaskan audiences will get a chance to see the magic too — after Snow Child closes at Arena, it moves to Alaska for performances in Juneau and Anchorage. A well-known Russian folktale tells the story of an elderly couple who yearned to have a child. They create a little girl out of snow, and she comes to life. Writer Eowyn Ivey reimagined that story in her novel "The Snow Child" and set it in her home state of Alaska. Now that book has been made into a musical at Arena Stage here in Washington. NPR's Lynn Neary has more. LYNN NEARY, BYLINE: In Eowyn Ivey's novel, the childless couple are homesteaders who have moved to Alaska from Pennsylvania in the 1920s. Ivey says seeing the stage version of her story was amazing. EOWYN IVEY: It was a kind of surreal and very moving experience to watch it, sort of like watching your dream come to life on a stage where everything is kind of the same but not quite the same, right? NEARY: Perhaps what surprised Ivey the most was the decision to turn the book into a musical. NEARY: Ten days before previews began, the cast and crew gathered to rehearse for the first time with all of the musicians. GEORGIA STITT: Hey, guys, I just want to say hi, and I would love to give a lovely welcome to our band. This is our band. NEARY: Among the observers that day were composers Bob Banghart and Georgia Stitt. Banghart is a native Alaskan with a background in folk music. Stitt, who also wrote the lyrics, has classical training and works in musical theater. STITT: Molly Smith sent me the book and said, do you think this is a musical? And I called her before I was done and I said, yeah, I'm not done with it yet, but it's definitely a musical. And she said, well, finish it and then we can talk (laughter). NEARY: Arena Stage artistic director Molly Smith was excited to do a play about Alaska. She is co-producing "Snow Child" with Perseverance Theatre, which she founded when she was living in Juneau. Smith says music seemed like a great way to give people a feel for what Alaska is really like. MOLLY SMITH: Because the natural world lends itself to a musical rendition and because I've always loved the music that is in Alaska, which is often bluegrass. I think of it as cabin music, some of the most popular music in the state. UNIDENTIFIED ACTOR #1: (As character, vocalizing). NEARY: In some songs, a couple of the actors join the string band with their own instruments. UNIDENTIFIED ACTORS: (As characters, singing) Grateful for the daylight, grateful for the moon, grateful for the silence and the talking and the tune, grateful to the God who provides another day. We wouldn't have it any other way, oh, Lord. We wouldn't have it any other way. BOB BANGHART: There was a long tradition of these types of instruments being up north, and then it really solidified in the '20s with record players. And then when radio came in, forget about it. All you hear is country music. So it's - I like it. We're building an interesting stew, but it is musical theater, and that's the part that I find so intriguing. UNIDENTIFIED ACTORS: (As characters, singing) We wouldn't have it any other way. NEARY: Another part of that stew is a sense of isolation that can be overwhelming in a place as vast and wild as Alaska. Georgia Stitt says they had to find a way to capture that as well. STITT: How do you create silence through music? How do you create space through music? You know, we're going to be on a stage that won't feel anything like what it would feel like to stand out in the open in Alaska. And yet we're trying to create that sense of emptiness, and how can the hollowness of the music express that? UNIDENTIFIED ACTOR #2: (As character) Hello, silence. NEARY: As the play opens, a woman stands alone on the stage. She and her husband, the childless couple, are heading into their second year in Alaska, struggling to create a farm out of the wilderness. She stands by a frozen river contemplating suicide. UNIDENTIFIED ACTOR #2: (As character, singing) I can see the water moving, crashing under sheets of ice - makes a person think twice. NEARY: When she hears what seems to be the voice of a child, she changes her mind. UNIDENTIFIED ACTOR #3: (As character, vocalizing). UNIDENTIFIED ACTOR #2: (As character) Who is it? NEARY: It's the snow child, who brings wildness and magic into the story. And magic, says Molly Smith, is a big part of Alaska. 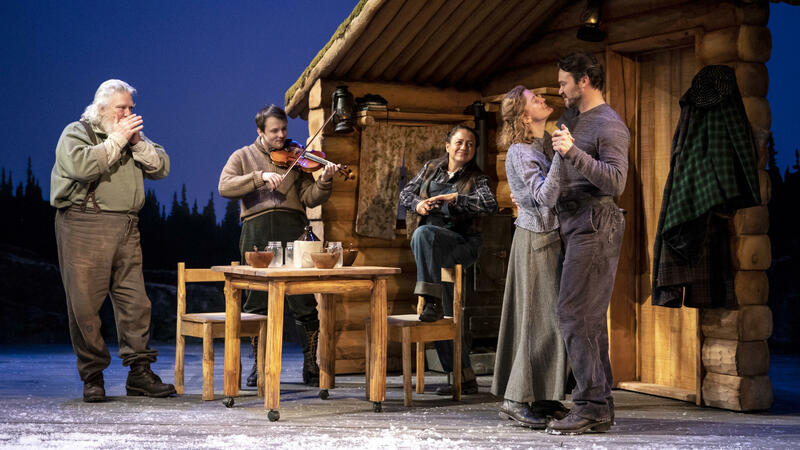 SMITH: The natural world is magic to me, so my whole question was if I can bring a piece of Alaska to the stage in any way, shape or form and allow the audience to see it and feel it, we'll be successful. So that's what we tried to do. NEARY: After "Snow Child" ends its run at Arena, it moves to Alaska for performances in Juneau and Anchorage. Lynn Neary, NPR News, Washington. UNIDENTIFIED ACTORS: (As characters, vocalizing). Transcript provided by NPR, Copyright NPR.